On September 20, US drone manufacturer Matternet unveiled an automated take-off and landing station for its drone systems, with each unit able to operate as a node within a delivery network. 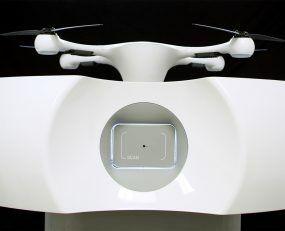 The Matternet Station facilitates the fully-automated exchange of batteries and packages, enabling autonomous point to point delivery of goods with minimal human intervention. The company announced that its first commercially operational network would serve hospitals throughout Switzerland, transporting blood and pathology samples between hospital facilities on-demand. The announcement follows the precedent set by Zipline, which has been successful in the drone-based transportation of medical supplies throughout Rwanda since October 2016. What makes each of these business models viable is infrastructure, or more specifically, its absence. The mountainous terrain of Switzerland constitutes one of the few areas in Western Europe where the delivery of medical samples cannot be executed rapidly through conventional channels, whilst the underdeveloped road network in Rwanda is more representative of its region. Other trials of drone delivery systems by European and American companies have also largely focussed on healthcare and pharmaceuticals, with DHL delivering medications from the German mainland to the North Sea island of Juist in 2014. Whilst conditions in Europe and Africa appear amenable to the use of drone delivery systems in support of medical operations, the application of drone technology in China has trended in a different direction. Both SF Express and JD.com are deploying drones in order to fulfil e-commerce deliveries throughout rural areas in China. The former has been running limited drone delivery operations in Beijing, Sichuan, Shaanxi and Jiangsu since 2016, as previously reported by Ti, and sees the technology as a competitive advantage over e-commerce rival Alibaba. During a June interview with CNBC, JD CEO Richard Liu stated the cost of serving rural areas, “will drop down at least 70 percent”, with the use of drones as opposed to cars or vans. JD runs a more vertically integrated business than rival Alibaba, in which it owns and operates its own logistics infrastructure to serve customers. By being able to serve rural customers more rapidly than its rival, the company may be able to expand its market share. That same month, leading courier S.F. Express announced a breakthrough, when the Chinese military awarded the company a commercial licence to operate in Jiangxi province. The announcement is significant as it marks the first time a company has been approved to set up such a service without tight monitoring from the authorities. JD, in contrast, must submit a flight plan to the military’s air-traffic control department each time it flies a drone. The conclusions to be taken from recent activity are clear; drones used for logistics in Europe will be set to execute deliveries in niche, time-critical areas where no other suitable options exist. In China however, it appears as though drone delivery will serve as a leapfrogging technology, allowing the expanding e-commerce industry to overcome substantial infrastructure deficits to reach consumers.